World Cup Finals – it’s the biggest festival on Earth for the beautiful game. We asked ourselves: “What got Indians excited about the 2018 edition?” Did the high-profile #MeriDoosriCountry campaign generate World Cup fever? Social media listening gave us some interesting glimpses. Into what aspects of the FIFA World Cup 2018 Indians engaged with. Social media is where people share content with their friends. The number of “shares” each piece of content gets – be it analysis and opinion, celebrity gossip, humour, controversy or memes – is arguably the strongest indicator of engagement. Delving deeper, what topics engaged maximum attention, was the underlying sentiment positive or negative and on which days did the fever rise highest? We analysed 6.5 lakh conversations that were shared on Facebook during 36 days from 12 June to 17 July – starting 2 days before and ending 2 days after the FIFA World Cup 2018. We focussed on Indian news sites that ranked within the top 500 sites in India as reported by Alexa. For this analysis we included only content pieces that got more than 500 shares on Facebook, accounting for 75% of the shares. Totally 378 stories figure in our analysis, meaning that these stories got an average of 17,000 shares each from Indians. See the graph below for the days when engagement shot up above average. 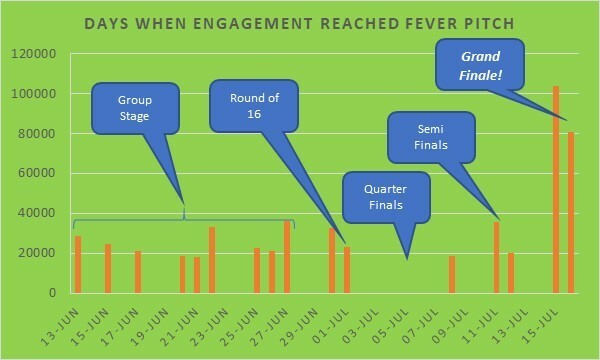 On the two days after the finals, engagement reached fever pitch. On the 16th it shot past the 1 lakh mark and on 17th July, past the 80,000 mark. In social media listening analysis we group by category to see the overall picture before drilling down into entities. It’s similar to slicing data first by product category and then by brand. We discover from the data what the categories and entities are. In this analysis, we have defined the type of news as “category”. We have defined personalities, countries, controversy, humour and memes as “topics”. 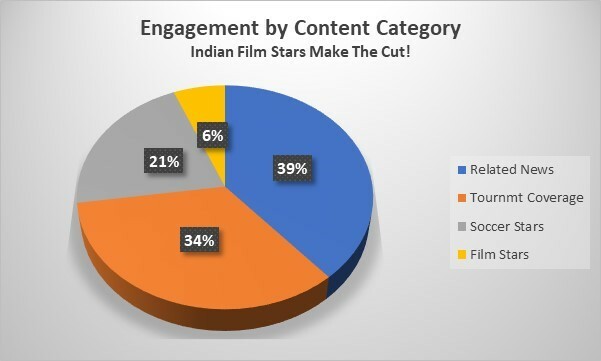 So, how much did Indians engage with content about soccer super-stars? How many shares did the tournament coverage itself garner. More specifically, how many positive and how many negative? Did any new stars emerge? How about the on-field action? The strategies that were tried out? What controversies caught Indians’ fancy? What memes went viral? Before the tournament began, the media had hyped up anticipation for the magic of Messi, Ronaldo and Neymar. Messi failed to live up to expectations on the field but on social media, Indians shared articles about him and Ronaldo 1.3 lakh times (Messi 71 thousand, Ronaldo 37 thousand and when both featured together 26 thousand). For poor Messi, Indians on social media gave him an overall thumbs-down. His failure to create magic and his tears at an early exit got the maximum notice. Ronaldo, though he also suffered an early exit, was given a thumbs-up, not only for his hat-trick against Spain but also for his gracious gestures on and off the field. As for Neymar, he lagged well behind with only 6 thousand Indian shares, mainly negative, for his theatrical diving! Maradona still holds sway, 24 years after he played his last World Cup match! His expert column was widely followed by Indian fans, getting 16 thousand shares. Which other soccer stars did Indian fans celebrate? Luka Modric, the man who led Croatia to its first ever final, got 12 thousand shares. The new teenage phenomenon Mbappe of France got 9 thousand mainly positive shares – for his gutsy performance and his gesture of donating his entire World Cup fees to help children with disabilities. Gareth Kane of England got 5 thousand and 11 other players got a total of 12 thousand. 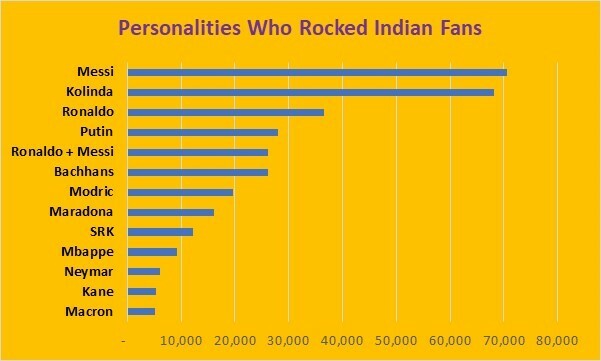 So, which other personalities caught Indian attention? The Croatian President, Ms Kolinda Grabar-Kitarovic won many hearts with her unique blend of grace, glamour and exuberant celebration, getting 68 thousand shares, almost as many as Lionel Messi. She got positive sentiment, in contrast to Messi. The French President Emmanuel Macron got 5 thousand, all on just one day – the day France won the World cup – for doing the “Pogba dab” dance and for the sheer joie-de-vivre he showed. And then there was Putin, who got trolled for the “umbrella” photo after the final, where he was the only VIP under an umbrella while Macron, Kolinda and other VIPs were congratulating players in the pouring rain. That story was shared 19 thousand times. Totally Putin got 28 thousand shares – coming off mainly in negative territory. The Bachhans grabbed attention in this galaxy – with more than 26 thousand. Shah Rukh Khan also ran, with 12 thousand. Social media listening is a useful tool for marketers to discover topics and entities that drive consumer engagement, to keep track of the tempo of engagement over time and to identify positive and negative sentiments relating to categories and brands. Another use of social media listening is to generate hypotheses about consumer perceptions and attitudes. This post uses the World Cup 2018 to demonstrate some of the insights that can be generated.